Old Trafford, Manchester - Manchester United Blog: How important is passing? Over the past few years Barcelona - in club football - and Spain - internationally - have demonstrated the value of good passing. With Xavi and Iniesta in the centre of the park, both sides have swept all before them in the global game with their brand of 'tiki taka' football. But how important is passing? Critics of the short passing style cite the slowness of the build up and the lack of excitement that can result from this apparently directionless approach. Indeed Spain won the world cup after a series of bland 1-0 victories and many Barcelona games are one sided with their opponents rarely getting a touch of the ball; making for a poor contest. For some, it is mere self indulgence, like the guitar player on a twenty minute solo, forgetting about the song. 'Tiki taka' can seem like a style of play that places more emphasis on 'aesthetics' rather than 'effectiveness'. On the other hand, purists would dismiss such critisism as 'uncultured' and point to Barca's wonderful attacking play, not to mention their goal scoring record. Compared to Barcelona, Manchester United have a more direct style of play, particularly when playing at home. United's reliance on pacy wingers means that fewer passes are required to achieve attacking positions with Valencia, Nani and Ashley Young carrying the ball into the final third of the pitch. In midfield, Carrick, Scholes, Fletcher, Cleverley and Anderson try to work the ball from defence to the wing with slightly longer passes than those favoured by Barcelona. Unlike Xavi and Iniesta who both like to get forward, one of United's central midfield pair then moves to cover the space vacated by the advancing full backs while the other often goes in support of the attack. As the table shows, Man City have completed the highest number of passes of any team in the top 5 this season. They have also made the highest number of passes in the attacking third. 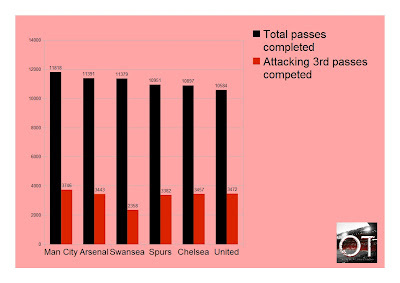 Interestingly, Manchester United, despite having the fewest number of overall passes completed, have the second highest number of passes in the attacking third. This suggests that United move the ball forward quicker than all other teams in the league and, importantly, once they get it forward they are able to control it. What this highlights is that United's style is far from a 'long ball' approach but rather a combination of direct passing and a 'ball carrier' approach. The table shows that United require fewer passes in order to score a goal than any other team in the league. They also require the fewest number of passes in the attacking third in order to find the net. What this seems to suggest is that United's approach players are quick to respond to the runs of the strikers. It also suggests that the players are 'in-tune' with one another and able to anticipate one another's movements. Swansea clearly lack quality in the final third. They have the third highest number of overall passes completed and yet their passes completed in the final third is abysmal as a percentage. From the table we see that, apart from Swansea, Chelsea have the most trouble in turning passes into goals. Although they have managed a similar number of passes in the final third as United have, they have scored 17 fewer goals than the reds. This points to a poorer quality of final ball and/or poor finishing. Although adrift of City and United in the passes to goals conversation rate, Spurs are the third best at making their passes count. If they could sharpen the cutting edge in the final third, they would be serious title contenders. 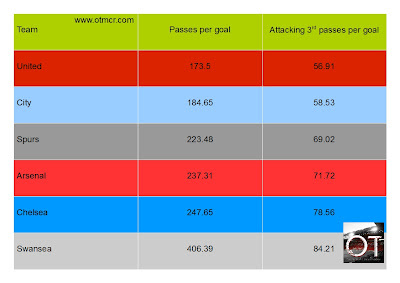 Arsenal were second overall in terms of passes completed but only 4th in the attacking third stats. This suggests a ponderous style and a lack of good approach play. City like to make passes, more so than any other English team. 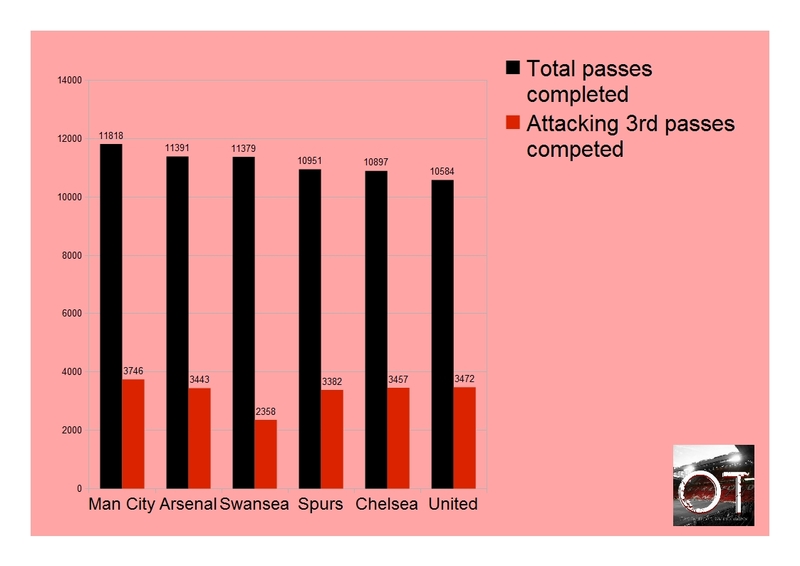 They also make more attacking third passes than anyone else, on average 10.96 per game more than United, and yet these extra passes (274 in total which is equal to more than half a game for the blues) have only yielded 3 more goals all season - essentially the three they scored in stoppage time at Old Trafford. Having said that, with the league as close as it is, those three goals could be priceless.